Each of our belt buckles are made using original hand forged golf clubs. 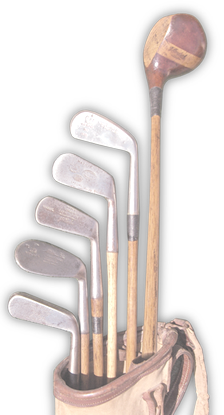 These clubs have been deemed unplayable by modern collectors because either the hickory shafts were cracked, were too whippy or the hozzle was just worn out. I was struck by the intricate engraving and unique markings, different on each club. The weight of them, the shape and the attention to detail in their creation was obvious. The cleek marks, company names and special stamping made them works of art in their hay day, and now with a little buff, they are transformed into a wearable art. I created my first belt out of one of these clubs for the pure pleasure to wear a piece of golf history with style. The compliments by many gave me the incentive to create these beautiful belts for others who love golf, but want to wear something more unique than the newest golf shirt on the shops rack. A Struckwell belt is 100 year old bling – solid stainless steel, that makes a classic statement for the love of the game, and a connection to the golfers who came before us. Hickory golf has been a passion of mine since the first day I played a round of golf with them a few years ago. 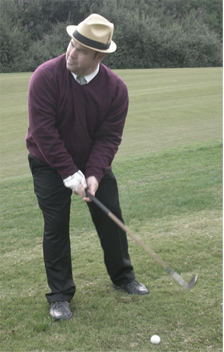 When you golf in a pressed shirt and tie, swinging a 90 year old club; something happens that is hard to explain. You connect with the games roots in a special way and understand the stories told by your grandfather like never before. Hickory golf may not be for every modern player but a new connection to the game and fashion statements usually are. Our belt buckles are both! Want to make a statement? Need a unique gift for the golfer who has it all? We’re here to help. There is a life-time warranty on all of our buckles. We stand behind our craftsmanship and will be happy to repair any buckle, as we all know golf is a tough game and is hard on our equipment. Each buckle is numbered in the order in which it was fashioned from a actual club head. No two are alike as they were originally forged by hand 80 to 100 years ago and now cut down, ground and pinned by hand here in the USA.